At Undercurrents, we believe that helping other paddlers become instructors and instructor trainers does not hurt our business; it helps us all! “The rising tide lifts all boats.” Others helped us become the instructors and instructor trainers we are today, and it our privilege to support others in their growth. 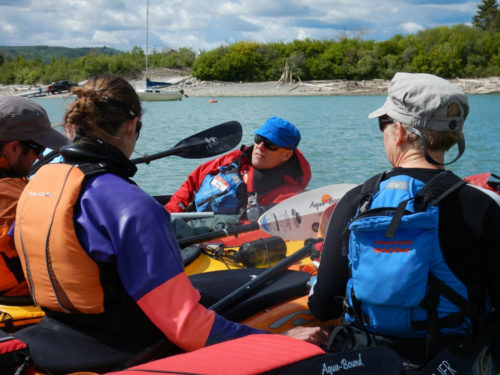 Instructor Apprenticeship: Serving as an apprentice is one way to become a paddling instructor; the other option is taking an instructor course. The benefits of apprenticing include real-life instruction of real-life paddlers with the guidance and support of the instructor trainer. The disadvantage is that the apprenticeship process takes longer than an instructor course. Instructor Trainer Apprenticeship: Serving as an apprentice, after completing the initial steps of the Paddle Canada IT Development Process, is the only way to become a Paddle Canada instructor trainer. Apprenticing to become an instructor or instructor trainer normally involves assisting on two courses under the guidance of an instructor trainer mentor. For the first course the apprentices acts as a helpful assistant while learning from the IT mentor. For the second course the apprentice takes the lead on most or all aspects of the instruction and administration. The IT mentor and the apprentice meet before the process begins and throughout the process for coaching and assessment. At the end of this apprenticeship you will have learned more than you expected. You will have the skills, knowledge and confidence to teach your own courses. You will receive the instructor or instructor trainer certification you sought. 1:2 (MAX) to ensure you of the best apprenticeship experience possible! Undercurrents has the highest concentration of highly certified instructors in Alberta. Accordingly, apprentices at a variety of levels are available in Sea Kayaking, Stand Up Paddleboarding and Canoeing! The mentor/apprentice relationship is a personal one, so an application and pre-apprenticeship meetings are required to ensure the process will be fruitful. Start early. The apprentices supplies all of their own gear. Current certification in Standard First Aid with CPR. (14-16 hours). Any other Paddle Canada prerequisites for the instructor or instructor trainer certification desired. IT apprentices must complete the Paddle Canada application process and the online learning module before their first apprenticeship course begins. However, we encourage you to make your apprenticeship arrangements beforehand. $149 per course apprenticed for an instructor certification. $199 per course apprenticed for an instructor trainer certification. Costs apply when apprenticing on a scheduled Undercurrents course. Our Instructor Trainers are available to mentor on other courses; contact our Chief Education Officer for a quote. Meetings and courses are dependent upon the availability of the IT mentor and the apprentice. Courses go rain or shine. Here in Alberta we can have rain, snow, blistering heat or high winds – sometimes on the same day. Don’t believe weather forecasts; dress for varying weather conditions. If you need help, our store staff can give you great advice!